With this view, you will feel like you are on top of the world. Rock your cares away on the over sized porch swing. Laughter is sure to echo across the screened porch. Lovingly appointed with deluxe furnishings. Let your heart take wing at Owl’s Roost Cabin, a pristine 2 bedroom, 2 & ½ bath log cabin high in the mountains. Between Bryson City and Cherokee, Owl’s Roost Cabin is conveniently located for all the area attractions. The main floor bedroom has a California king-size bed, mountain view, deck access and private bath with jetted tub and stone tile shower. The hallway off the kitchen on the main floor has a half bath. The second bedroom upstairs has a king-size bed with a private bath. This bathroom has a tub and shower combination. There is a regular sleeper sofa and one twin-size sleeper sofa in the loft. You’ll love the charming wood interior coupled with the welcoming gas fireplace and leather sofas in the living room. Snuggle up in front of the fire any time of year and watch your favorite shows and movies on the HD Satellite TV or find a new favorite while you’re relaxing in the Smokys. Elegant and fully equipped, the all new kitchen will be a breeze to cook in with two ovens, stainless steel appliances, and gleaming granite countertops. . A breakfast bar adds extra seating with the dining table seating six. Let the ceiling fan on the porch cool you on sunny afternoons. Enjoy meals al fresco on the huge covered porch. We had an exceptional stay at the Owls Roost. We truly appreciate the detailed directions that were sent to us. It helped us find the house without any issues since we reached in the middle of the night due to flight delays. The home was beautiful and comfortable. The modern amenities in the home were to our liking. The views were spectacular and we had a great time soaking in the beauty of the Smokies from the wrap around porch of the house. The closed-in porch was an ideal place for us to have meals together in the evening. There are trees all around the house and it seems like you are in the middle of a quiet forest. But the house is actually very close to Bryson city. Getting supplies etc. is a breeze. If you don't want the hustle and bustle of tourists on the Tennessee side of the Smokies, staying at this home is highly recommended to enjoy the Smokies from the Carolina side. This home is minutes from the Park. Overall, we had a fantastic time in the Smokeys and the home made it extra special for us! 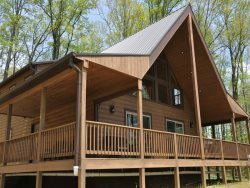 We recommend this home to anyone that is looking for a home away from home while visiting the Smokies. Cathy and Kelly were so great to work with and made the whole experience so very easy! We completely enjoyed our stay at this beautiful cabin. Between the back and side porches. I don't think that sat down inside once! The only down side was that were torn between enjoying the cabin and getting out to do things. We can't wait to come back and maybe next time we will let our kids come. It was very easy and everything was taken care of for us. The directions to get there and the lock box were sent to us in plenty of time to copy before we left. Our family loved everything about this cabin. It was exactly the "mountain vacation" that we had in mind. We loved white water rafting at the NOC. The trip from Illinois was worth it! We would love to visit again. We will return soon. The temps were great and the area had rain. But we didn't mind. The storms were wonderful to watch and hear. We needed this time to rest and that is what we did. We will be back again in the Fall. Can't wait. Everyone I spoke with was wonderful! Great customer service! Excellent service and no complaints. Cabin was great! We had a great family vacation for our weekend here. The views are fantastic. This was great day to say the least. We had so much fun here with the people we love. Can't wait to come back. This is an awesome cabin. We really enjoyed and had a lot of fun. It has a beautiful view. Thank you so much. This was a weekend getaway with friends and it did not disappoint. The cabin is beautiful and the views are amazing. We had a great time. WE want to come back again soon. Thank you so much. Owl's Roost cabin was delightful! Booking was so easy and checking in consisted of using a lock box code provided by GSCR. The cabin was only minutes from the Polar Express in Bryson City. The cabin was beautiful and had everything we needed. We enjoyed a fire on the screened in porch. It was a great weekend. I would highly recommend Owl's Roost! Very nice to speak with over the phone, knowledgeable about the properties and area. This is a beautiful cabin and a great place to stay. We enjoyed our stay. We were truly blessed to have found this cabin in the internet. THank you so much for opening your cabin and allowing others to experience this peaceful retreat you have. There is not one thing I would change about this place; porch, fireplace, fire pit, swing, inside, owls beautiful all of it. Your staff members are wonderful. Each time we have had contact, they have been friendly professional, and knowledgeable. Including past stays, we have had a variety of questions, and requests. Each has been handled very well. The lady working that weekend even called to check on us to be sure we had arrived safely. The girls are very helpful & there to answer any questions you may have.